Maybe just a start. I’m sure many of you are very familiar with gafe Coull so gafe is probably best known for the research product that they write in terms of the macro. Maybe our team in China would dragon nomics I’m sure many of you have met Charles and Louis gavelled maybe Anatol Gillespie. 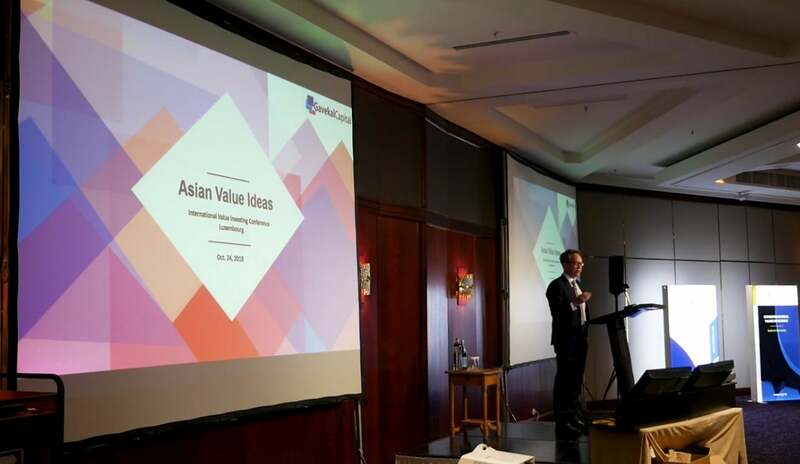 Actually I joined about just over four years ago to join the capital side to launch what we call the Asian Value Fund. This is a very straightforward fund. We invested about 30 to 35 names across Asia ex Japan primarily on a bottom up basis. We don’t do any hedging. No we don’t do any currency hedging no futures and shorting it’s just very straightforward stock picking. Maybe just before I start I just want to discuss what do I believe in this is a very basic table here. So like many of you I’m a fundamental investor. I believe in valuation. I believe the fundamentals and valuation together drive. Share prices over the very long term. One other thing I’d like to note and I’m going to say this now because it comes into play with some of my ideas is that I also believe that in the short term you have what you call what I call relative change in expectations. So if there’s no macro or sentiment or changes in the outlook for a company you might have a company that is very cheap but if the outlook begins to look a little worse you can get a bit cheaper. And so I try to manage for that. But over the long term we’re really keen for the companies that have strong fundamentals and a good valuation over the long term. Where do we hunt for value. So I find every time that I talk to people the word value seems to mean different things to different people. So for me the way I think about it is peace and peace and price to book ratios are very important multiples to help indicate value. But to me is simply a low P and a low price to book is not the most the best indicator of value. What I’m really trying to do is to find companies that are trading at a significant discount to what I call the economic productivity. So in that case at least in where I were I’m looking for my investment opportunities in Asia Japan what we do is we look at primarily quality names that are trading at attractive valuations and the reason for that is very simple. Companies with a competitive advantage are sustainable. We have very good profitability higher returns than their peers that can be compounded over long periods of time and they tend to outperform. Now that that tends to be about 75 percent of the portfolio just very roughly now about 25 percent of the portfolio. I also invest in what I call deep value which is more of a traditional way of looking at value. The reason that I really liked some of the devalued ideas obviously is that they have very good risk reward characteristics you know very little downside maybe a lot of upside. So the real risks here are that you find yourself in a value trap or you find that you don’t have the patience to wait for it to play out. One reason I don’t do 100 percent devalue portfolio in Asia is that I just find that it’s very difficult to find a lot of a decent number of these good ideas. And I think part of the reason is people may argue with me. But my personal experience is that if you find companies in Asia that have very great asset value that’s not reflected in the share price. You just don’t have the legal framework to enforce those companies to make a change. I think we’ve seen a lot of activists and shareholders come to Asia especially from the United States and really fail to be able to push those things through. I also think that there’s a cultural issue where you have a lot of companies that are family owned. And their view is that it’s not just about getting the share price up. It’s the source of their comfort. They’re you know kind of their power. They don’t need to make these changes and they certainly don’t need you to tell them to do it. One other opportunity I think is growing in Asia is dividends. We’ve seen a lot of companies with very great balance sheets very low payout ratios huge cash flows cap ex have been down. So I think over the longer term you’re really going to see a huge opportunity. It just may take time. I want to skip this slide. Now given the kind of. Declines that we’ve seen in Asia ex Japan I just added this slide because I just wanted to talk about you know what do I think about the Asian markets. It’s not it’s not really my business to sit around and try to figure out where the bottom is in the market or where the top is going to be. But I do think it’s important to have some kind of framework to think about it. Specially in the situation as we have today where you’re seeing a lot of babies thrown out with the bathwater. So we want to be able to think about it can we even see the floor. And so what I’ve done here is is just.